The Andrew Pickens Ranger District has started to implement a large project to remove non-native loblolly pine stands that were widely planted on the district during the 1960s-1990s. 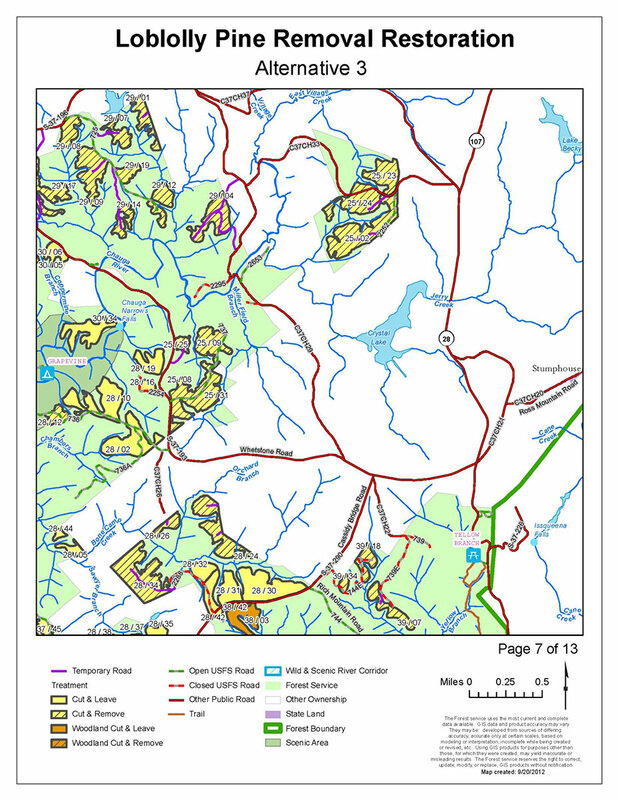 The project affects 5,542 acres and calls for replacing the loblolly pines with “native pine and hardwood ecosystems,” and includes timber harvesting, road reconstruction and herbicide application. The Chattooga Conservancy participated in the scoping process for this big project, which resulted in some favorable modifications to the initial proposal. We are now monitoring its implementation, to call out any adverse effects to our public lands. 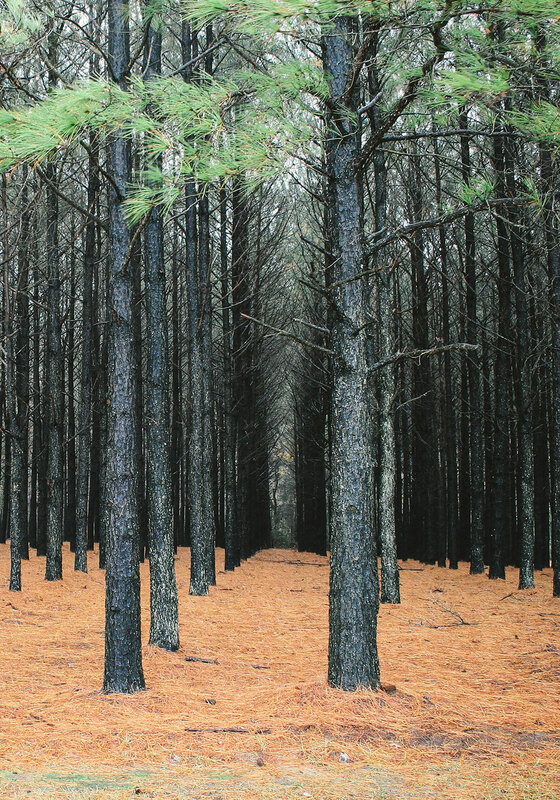 The Forest Service’s original Loblolly pine removal proposal proposed herbicide applications on 3,264 acres; logging 6,000 acres in the next 5 years, and then re-planting Short Leaf pine seedlings on a 12’ x 12’ spacing (Short Leaf is a native pine, but the close spacing would crowd out other species); and, “re-constructing” 59.2 miles of roads and building another 8.2 miles of new roads. 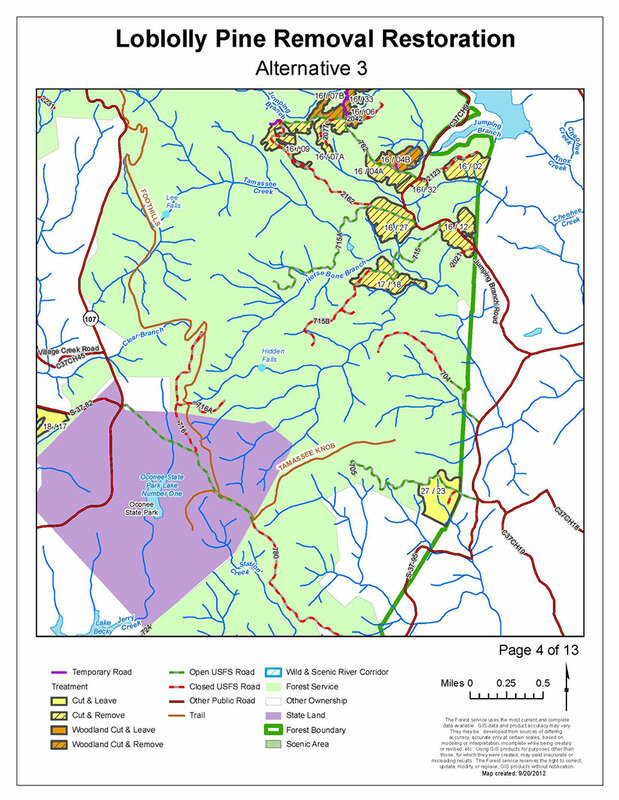 In our opinion, this did not look like ecosystem restoration; rather, it appeared to be the start of another round of pine plantations, along with building miles and miles of new and re-constructed roads. 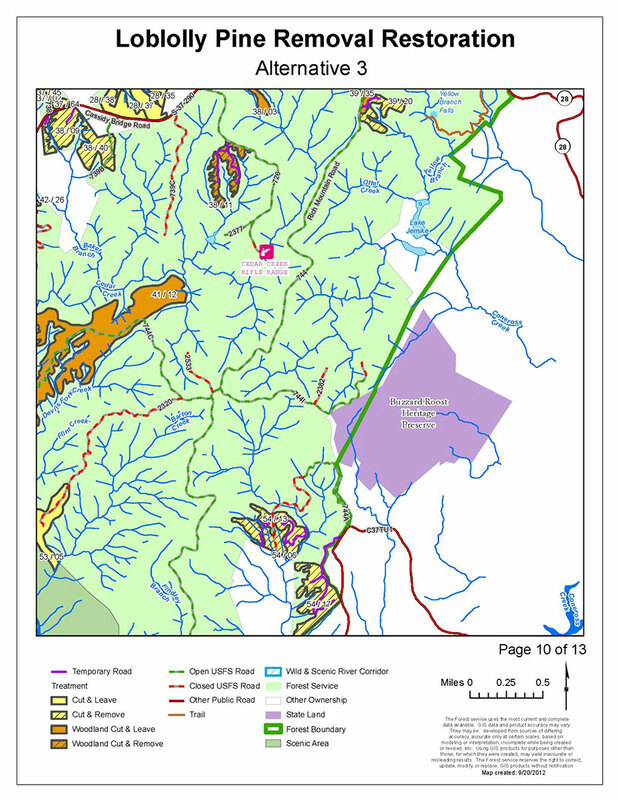 The Chattooga Conservancy agreed with the need for the project, but was critical of numerous details of the proposal. 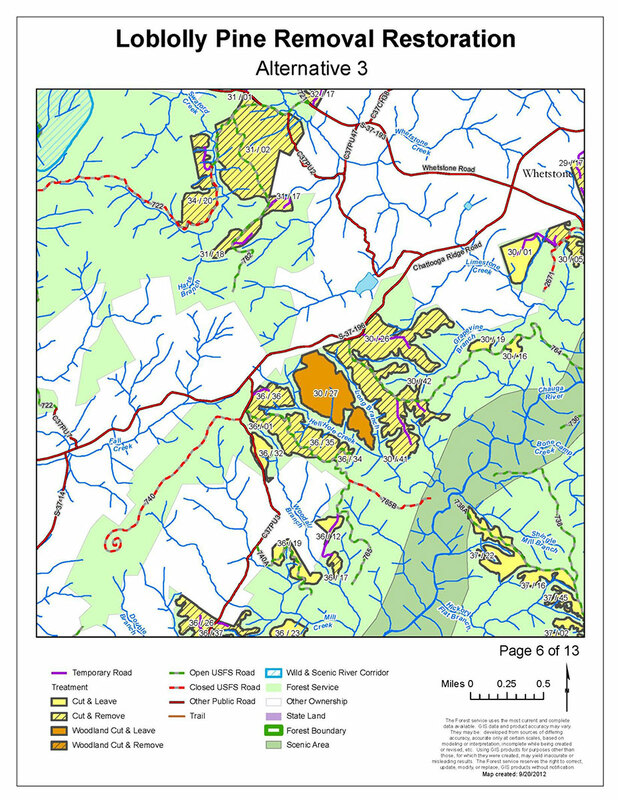 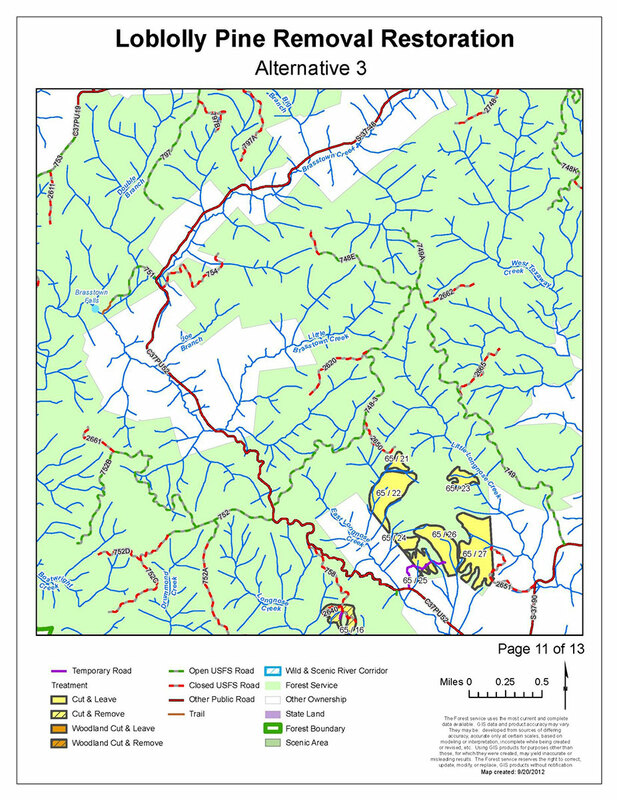 We recommended the following changes: 1) Employ landscape planning science that is based on soil type, slope and aspect, to predict the potential native vegetation on each former loblolly pine stand site; 2) After cutting the loblolly plantations, regenerate the true native forest type for the Chattooga watershed, which is composed of predominantly hardwood species; and, 3) Do not build or re-construct more system roads for access (by the Forest Service’s own admission, the district already has excessive road densities), but instead manage the loblolly pine sites by either “cut-and-leave” treatments or by “benign neglect,” both of which would favor the regeneration of a native forest type. 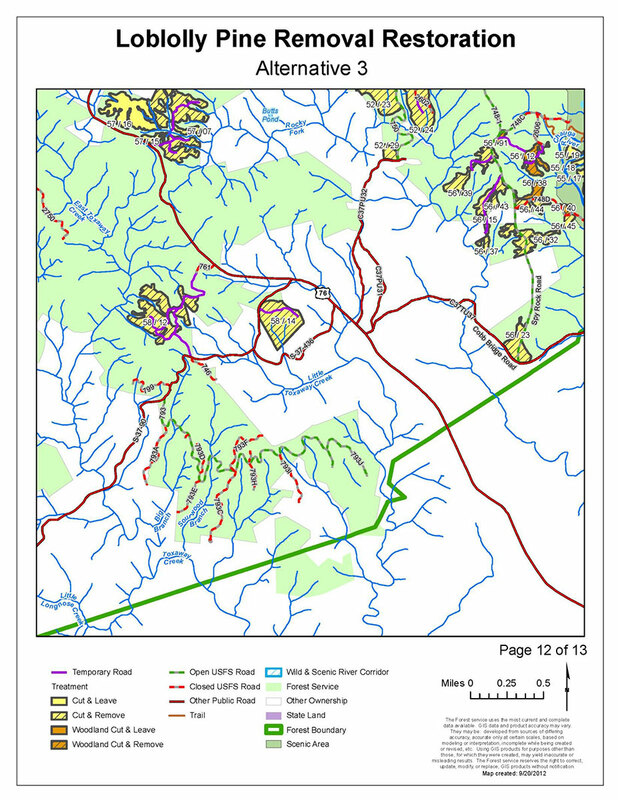 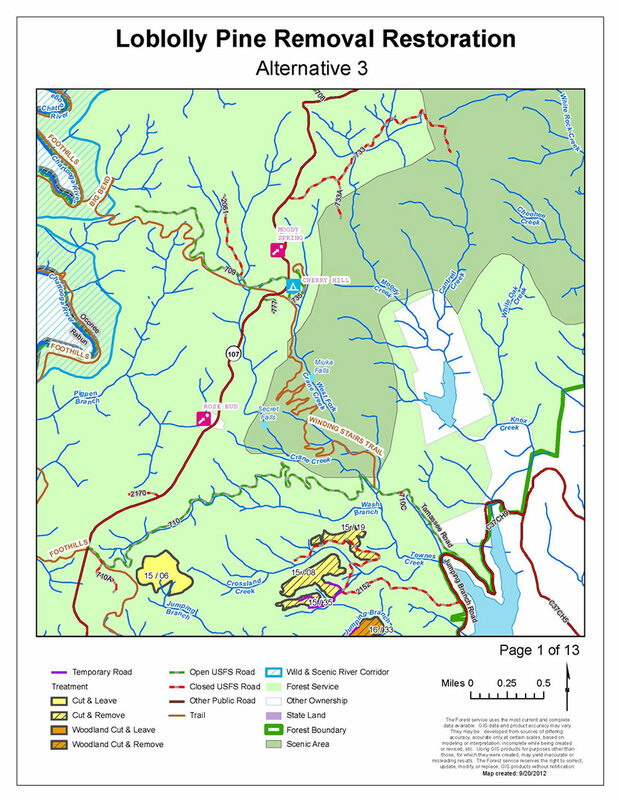 The Forest Service’s final decision was to implement 3,172 acres of cut/remove timber harvest; 1,587 acres of cut/leave timber harvest; 5,542 acres of site preparation and release treatments, that could include prescribed burning and herbicides; 2,833 acres of reforestation treatments, to establish 300-435 native trees per acre; 784 acres of “woodland” treatments; maintenance/reconstruction of 47.5 miles of existing Forest Service roads; and constructing 24.9 miles of temporary roads, that would be closed and obliterated after use. 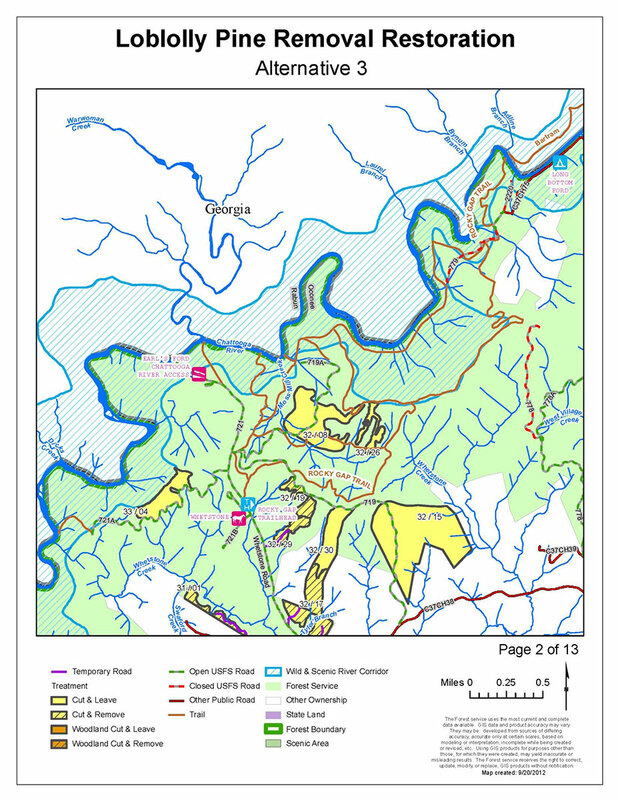 The Loblolly Pine removal project in the Andrew Pickens Ranger District will be ongoing for a number of years. 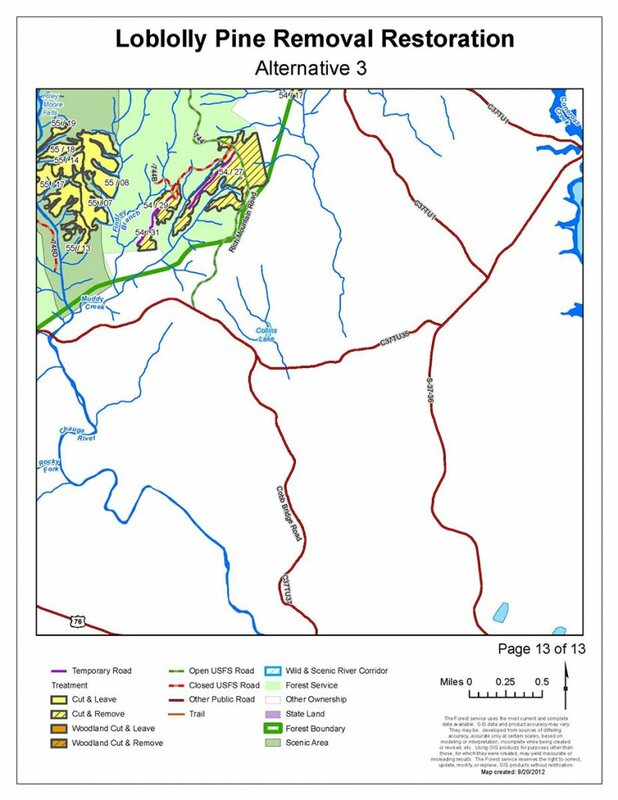 Our comments on the Loblolly project generated some favorable changes to the Forest Service’s original proposal, and citizen oversight of the on-the-ground work is needed. 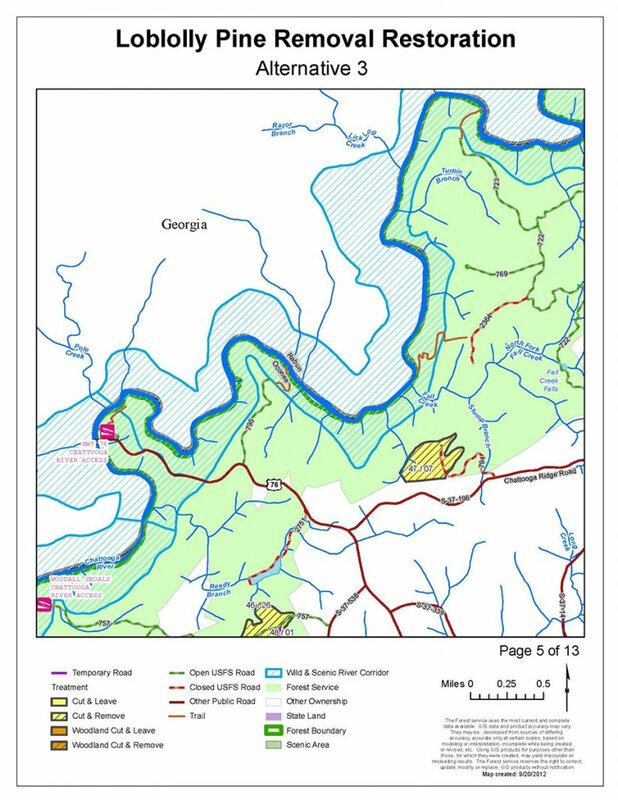 Please contact the Chattooga Conservancy if you are interested in helping monitor this massive project. 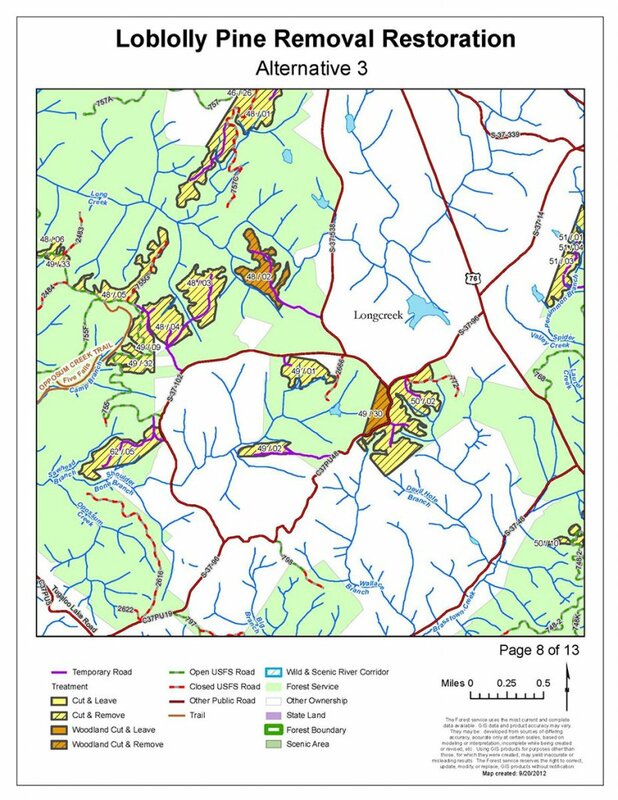 We are concerned that the project might be replacing (non-native) Loblolly pine plantations with native pine tree plantations, rather than restoring the diversity of hardwood and pines trees found in our native forest. 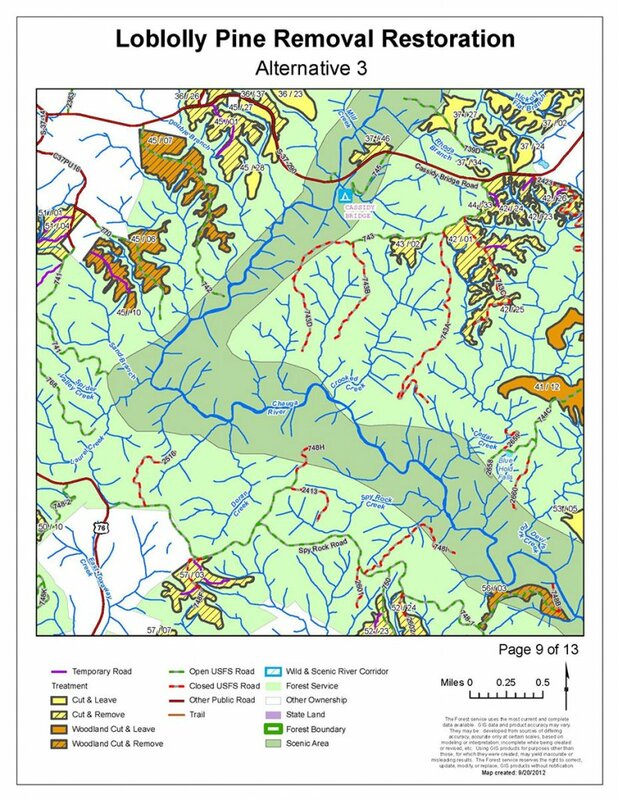 Please help check up on these areas, and contact us with your observations! 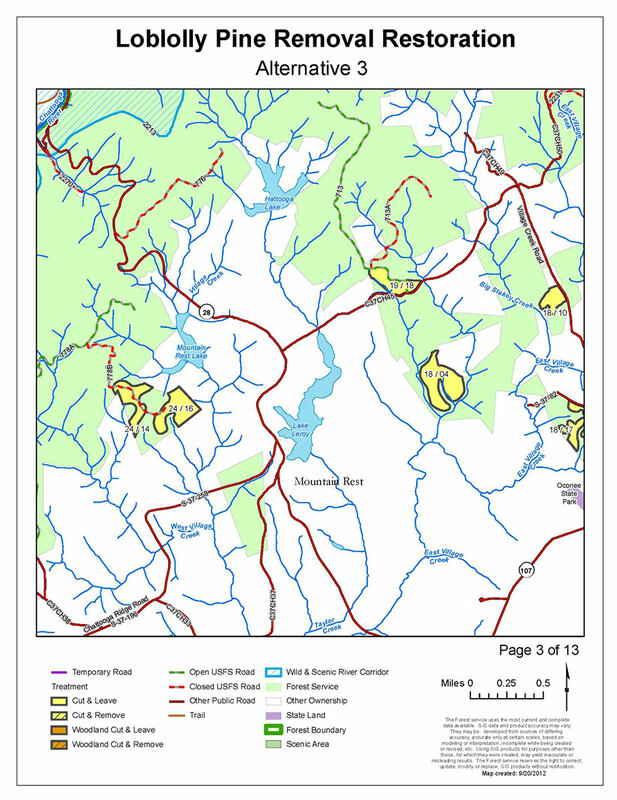 Here are maps of the areas that are targeted in the project.